Many organic contaminants in the air and in drinking water need to be detected at very low-level concentrations. 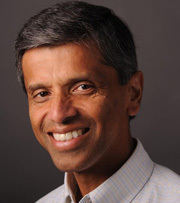 Research published by the laboratory of Prashant V. Kamat, the John A. Zahm Professor of Science at the University of Notre Dame, could be beneficial in detecting those contaminants. The Kamat laboratory uses Surface-Enhanced Raman Spectroscopy to make use of silver nanoparticles to increase the sensitivity limit of chemical detection. Researchers in this study have prepared a semiconductor-graphene-metal film that has distinct advantages: The absorption of organic molecules on the film’s graphene surface increases the local contaminant concentration adjacent to silver nanoparticles. 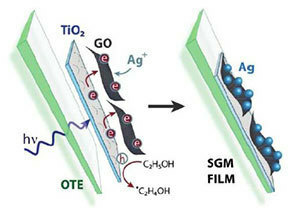 Under UV illumination, the electrons from TiO2 are captured by the graphene oxide film and shuttled across the film to reduce metal ions into metal nanoparticles. This electron-hopping process across the graphene oxide film allows the design of a side-separated semiconductor-metal nanoparticle architecture. Graphene, a two-dimensional crystalline form of carbon, is known for its remarkable mechanical strength, very high thermal and electrical conductivity and broad variety of applications. While the conducting properties of graphene sheets deposited on various substrates are well understood, the Kamat group has demonstrated that the transport of electrons is not limited to the 2-D plane. Here, the hopping of electrons from one side of the graphene allows for the side-selective deposition of silver nanoparticles. The paper, “Electron Hopping Through Single-to-Few-Layer Grapheme Oxide Films: Side-Selective Photocatalytic Deposition of Metal Nanoparticles,” was published recently in the Journal of Physical Chemistry Letters. Authors are Ian Lightcap, Sean Murphy, Timothy Schumer and Kamat. The research was supported by the Office of Basic Energy Sciences, Department of Energy. Originally published by Marissa Gebhard at newsinfo.nd.edu on June 05, 2012.